Katie Price also known by her pseudonym Jordan was born in the United Kingdom in the year of 1978 on May 22. She is popular for being a super model and an attractive television personality. In both sectors, she has represented herself as a role model for many girls who desire to enter the glamour industry. She simply knows how to stay in the spotlight and on page3 also. Naturally, this person can have a fascination for some wondrous things that can add something more to her feminine grandeur and that she has done also by making various tattoos on her body to make it catchier. Katie has a pink bow tattoo on her lower back where the bow may be a symbol of her liberation in spite of being a woman. On the other, it bears womanly aspect because of its colour and design which is really cute as well as cool. This famed model also possesses a crown tattoo on her left wrist to signify her power and wealth as a super lady. 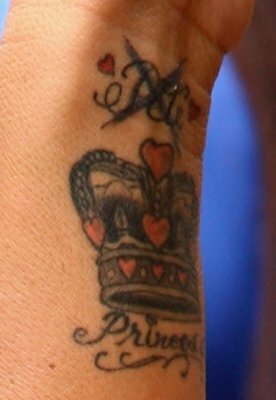 Beneath this tattoo she has pasted the name of her daughter Princess who is her actual wealth.